Look at that simple word: tone! It’s what makes an ‘ukulele player sounds the way he or she does. It’s obvious that every person on the planet has a different set of fingerprints. What is less obvious is that each musician also has a unique “musical fingerprint.” This is a person’s sound. It’s how they pick the string or fret a note. It’s what tone they create without thinking about it. This can also fade into “style” a bit, but I consider style to be more about music choices and tone about sound choices. But both go hand in hand to give a player a signature sound. Tone can also refer to frequency balance like a “tone” knob on a pickup, but I’m more interested in the playing element of tone. There are some parts of sound you can immediately control and some parts that you can’t. Each list could go on and on. The things you can change vastly outweigh the things you can’t. A good player can make just about any instrument sound good, but the nicest ‘ukulele in the world won’t help someone who’s just picked up the instrument. That’s why spending time making sure you are creating the best sounds possible is important. It doesn’t matter how great your notes are if they sound bad. How tightly you hold the ‘ukulele. Using the fingernail or the flesh of your picking finger. Picking with upstrokes or downstrokes. The angle of your picking attack. The ‘ukulele is a resonating chamber. If it wasn’t, they would all be built like an electric guitar – a stick with strings. A certain amount of your body touches the instrument when you hold it – there’s no way around it. But if you are always bear hugging your ‘ukulele, your tone is probably more trapped than it should be. Experiment by playing with as much of the body uncovered as possible and then stifle the back, sides, and top and listen for the difference. 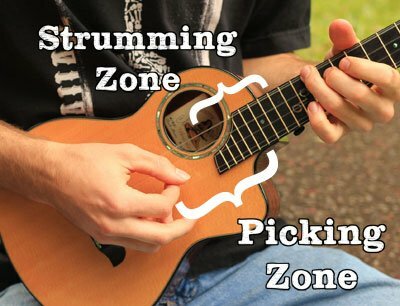 Where you attack the strings makes a huge difference in the sound your ‘ukulele produces. If you pick closer to the bridge the tone is brighter and more snarly. It you pick closer to your fretting hand the tone gets warmer and more mellow – almost hollow. The are tons of possibilities between (and beyond) those two extremes, but the go-to sweet spots are illustrated to the right. Even half an inch will change the sound more than you think. Keep in mind that you don’t need to stay in one spot all the time. Some parts need to be closer to the bridge, some don’t. There are two other distinct “effect” sounds you can get from picking location. One of them is right next to the bridge. This is the banjo sound. The other is very close to your fretting hand, picking up on the fretboard. A kind of “koto” sound. How you interact with the strings is where most tone comes from so it only makes sense that what your point of contact is made of will also alter the sound. Using the flesh of your finger creates the most soft and dark sound. A fingernail is brighter and creates a more precise attack. Whether a thumbpick or a flatpick (cheating! ), any piece of plastic will give you the most bright sound and pop. If you are using you fingernails, the way you shape them contributes a lot to the sound. Check out the fingernail care page. Manipulating the volume is kind of a feel thing more than a tone thing, but it does change the sound so let’s take a quick peek. By plucking hard you are pushing the string into a more aggressive arc. This usually causes sort of a compressed sound as the string hits the edge of its physical limitations. This is the edgy sound that Jake plays with a lot. Playing softer allows the string lots of headroom to ring in a much more balanced and pleasant way. If you can believe it, your fretting hand does have a role in tone. It’s not just “buzz” and “no buzz”. With some experimenting you can find a sweet spot inside the fret the allows for optimum tone. This sweet spot is about 2/3 up the inside of the fret – just past half way. For more on this, read up on how to play clean.